This is a simple system which supports a typical basic announce booth. It provides Play-by-Play, Color, and Spare announce headsets, three stick mics with IFBs for an on-camera standup position, stage manager, stats, scoring and audio PLs all with program audio, and a few spare inputs and outputs for crowd mics, RF mics/ifbs, or similar. 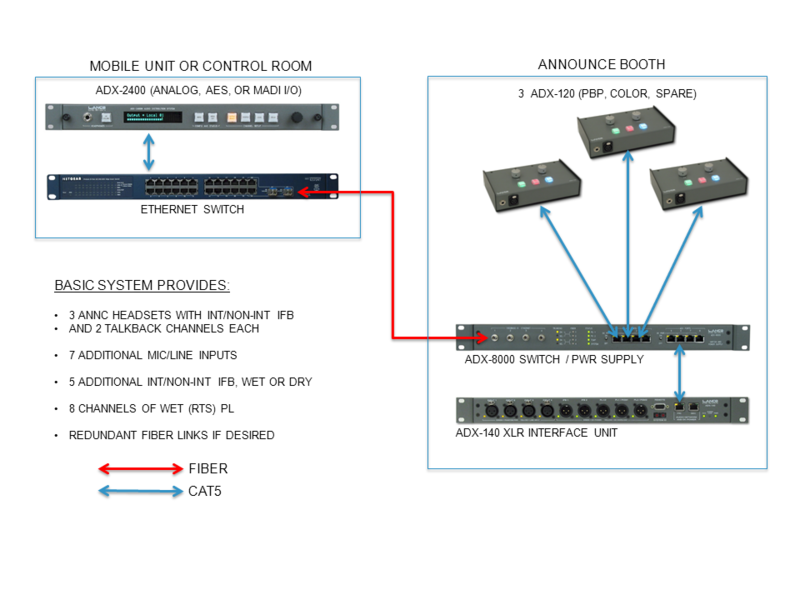 It is a very cost-effective system for shifting announce booth operation from DT-12 copper to fiber, and the entire booth can be operated on one strand of fiber. Two strands of fiber may be used for redundancy if desired. The rack equipment required for the booth occupies a total of 2RU, and is extremely compact and lightweight. No other equipment is required except for microphones, headsets, and PL and IFB beltpacks.